There seem to be some problem with iOS 4.0, which is restricting service providers to automatically update GPRS settings after the SIM card is inserted. It definitely worked with the previous versions of iPhone operating systems. After successfully jail breaking and unlocking my iPhone 3G with iOS 4.0 using the direct links to all required applications, I stuck up on having my GPRS not working. I am using Airtel SIM card (India). The settings were automatically updated when I was on iOS 3.1.2 but with iOS 4.0 there seem to be some problem. 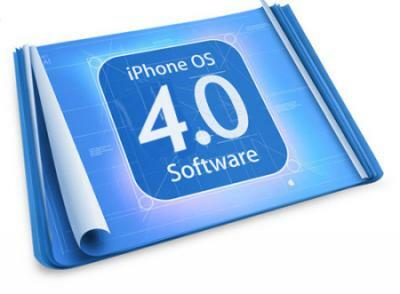 Anyways, I am not here to discuss problems in OS 4.0 rather solutions or temporary work around. I looked into my iPhone completely but I could not find the “Cellular Data Network” setting under “Settings > General > Network >” so could not manually update the GPRS or APN settings. Somebody told me to insert Reliance GSM SIM card once and it will make the setting visible (seem to be some flaw in the Reliance GSM card) but I did not have that so another nonviable option for me. Happiest man on the earth once again. Ensure to mention both Name and Identifier under General section as both are mandatory fields. 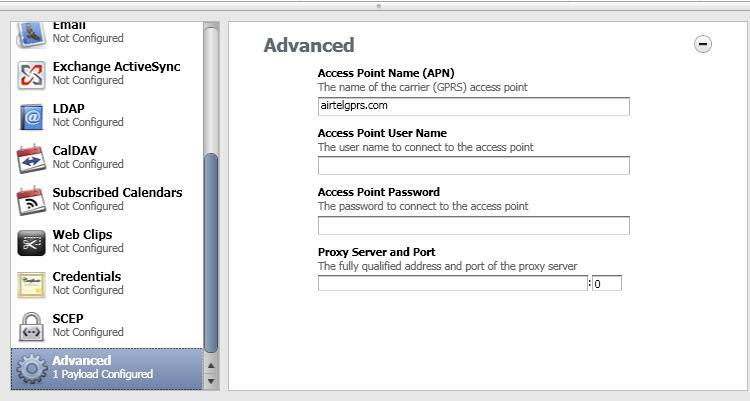 For Airtel India only airtelgprs.com is required in the Access Point Name (APN) field. For troubleshooting just look into Devices/<phone>/Console for error messages. And from here you can directly download all required files/applications to jailbreak and unlock iPhone 3G. Hey pal. Thanks for the share. I have done whatever you said using the utility. Now I am just wondering how to install it on the phone. 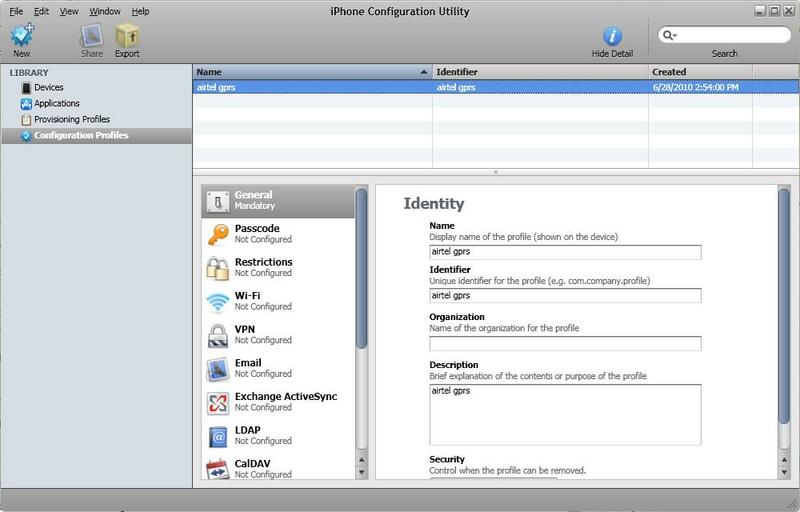 Connect your iphone, should pop up in Configuration Utility as in iTunes, go to “configuration profiles tab”, chose install, a notification should appear on your phone, choose “install”. After install it should work directly. It works like a charm buddy… amazing thanks a ton. Wow! Am I a happy man to have solved this! Thanks a lot. About the installation: I had to restart my iPhone 3G untill i got a notification to install configuration profile. After that, it got installed, and i was up and running. Thankyou, I have been breaking my head for this for the past week. your detailed explanation helped me to get GPRS back it is working like a charm. i tried using the iphoen configuration utility but still not able to access internet. pls help. Did you restart your iPhone twice?? Have u got ur GPRS activated?? hey dude!!! !when im installing it is giving an error message…”PROFILE FAILED TO INSTALL. ONLY ONE APN CONFIGURATION CAN BE INSTALLED AT A TIME.” plz help me man….. Unfortunately, there’s no current profile. I can’t uninstall if it does not show anywhere.. The message “PROFILE FAILED TO INSTALL. ONLY ONE APN CONFIGURATION CAN BE INSTALLED AT A TIME” keeps popping up. Holy f**k! This is definitely an issue … I couldn’t connect to unlockiit.co.nz to install another profile wherein it kept saying profile already installed ..
this works also on operators like RELIANCE GSM not providing GPRS for iphone 3G. Hope the mail helped !! Thanks for sharing the info Ramki ..
Im using the Rs.198 / 2GB plan, my data usage on Edge is only for Push MAIL & sometimes facebook. I’m a IT Network Engnr myself and to what I presume from the above scenario is If I HardCode the APN settings from the above mentioned HACK, will the EDGE consistency improve..
Do other people here(I’m in Delhi) on Airtel GPRS experience such outage, especially when switching on & off from Wifi to EDGE ??? The problem that you mentioned, I also face sometimes .. here in delhi and pune too … I also do airplane mode and then back … and then it works … but it is not as frequent as u might be facing .. it happens to me once in 2 weeks or so … it may be due to the airtel network problem though .. still need to find out that ….